Within today’s dynamic education system, providing your staff with the skills, knowledge and ability to adapt is vital for continuing improvement. The challenge in doing this increases when developing a training process that will have a lasting impact, therefore finding the right strategy for your staff development is crucial. When coaching is used to compliment a CPD programme, research has shown that there is a greater and more lasting improvement. Although a relatively new concept to the UK, coaching has grounded support in that it enables individuals and teams to grow and flourish, take responsibility for their own learning and achieve their professional goals. Through our coaching for education services, we have supported several schools in developing a successful coaching culture, ultimately enabling them to achieve long lasting improvement. Aspire Alternative Provision is a group of four schools in Buckinghamshire who provide ‘outstanding’ education and support for secondary level students. 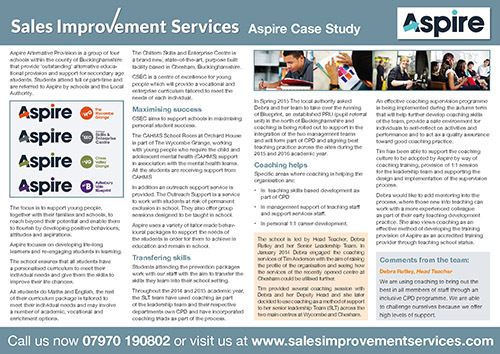 In this case study, you will learn how they have utilised coaching to raise their school profile, increase skills based development as part of their CPD and support their Senior Leadership Team (SLT). 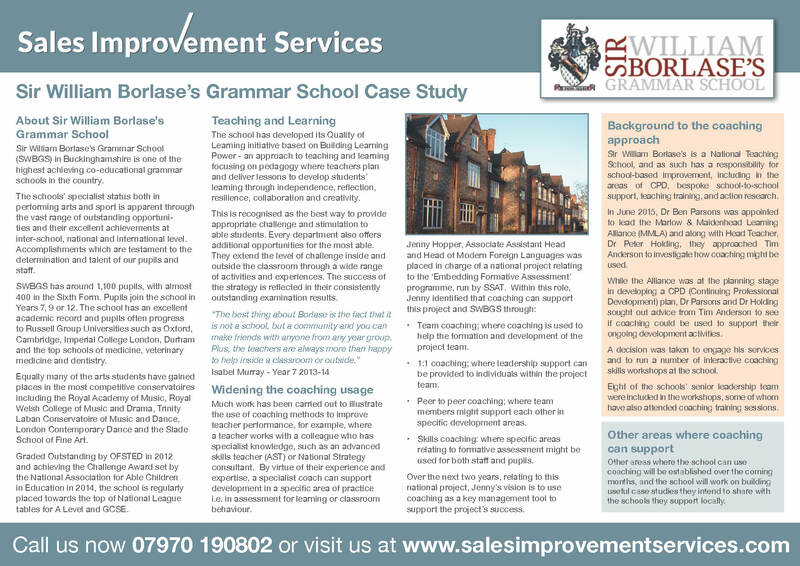 Sir William Borlase’s Grammar School (SWBGS) is a National Teaching School, and as such has a responsibility for school-based improvement. In June 2015, SWBGS approached Tim Anderson to investigate how coaching could be used to support their CPD programme including: team coaching, 1:1 coaching, peer coaching and skills development coaching.